← Constitution Day. Who was “elected” to all 3 branches? 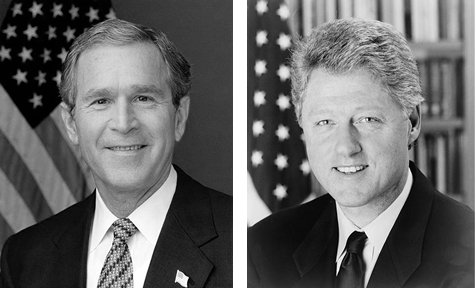 George W. Bush and Bill Clinton, officials portraits, Library of Congress. This year marks six years since Barack Obama was elected president in 2008. Like other presidents before him who have served two terms, he faces a midterm election that could effect the rest of his presidency, especially if the Republicans change the balance of power by taking control of the U.S. Senate. On Nov. 4, 2014, Americans will elect local and state leaders, members of Congress, and, in many states, a U.S. Senator. To put the 2014 midterm elections into historical context, what were the midterm results of other presidents who held two terms or who reached a sixth year? Let’s look at the two most recent presidents who faced midterms in a second term. 2006 was a change in power election, with the Democrats taking control of both the House of Representatives and U.S. Senate for the first time in 12 years. The Democrats gained 32 members in the House and six seats in the Senate with one Democratic senator converting to an independent but agreeing to caucus with the Democrats. The driving issues were dissatisfaction with the War in Iraq and moral scandals in Congress. President Bush’s approval ratings were in the 40% range. In contrast, the Republicans gained 10 seats during the midterm elections in Bush’s first term in 2002. This was a modest election, but historic because it defied the typical trend of the president’s party losing seats. Instead the Republicans lost five seats in House of Representatives but retained a majority in both the Senate and House. Despite a moral scandal involving a White House intern, President Clinton’s approval rating was in the 60% range in 1998, likely because the economy was strong. The federal government had reached a budget surplus for the first time in nearly 30 years and more than 70% of Americans had confidence in the economy. In addition, Clinton had already faced his worst midterm election. The Republicans had swept the 1994 midterms, when Clinton’s approval was 37%, the lowest of his presidency. The 1994 midterms were called the Republican Revolution because the Republicans gained 54 seats in the House of Representatives and eight seats in the Senate. This entry was posted in History, Politics and tagged #TBT, #TBThursday, Barack Obama, midterms, Ronald Reagan. Bookmark the permalink.